1.Add the product(s) to your cart or wishlist. 2.Open the Banggood app and find the product(s) in the cart or wishlist. 3.Pay for your order and get your discount ! Click here for more app only deals. Scan the QR Code to save more. First login on the APP will get extra 10%OFF coupon! *Estimated fee, the actual amount is calculated during checkout. This warehouse can not ship to your location. To confirm that this part fits your vehicle, please enter your vehicle's details below. 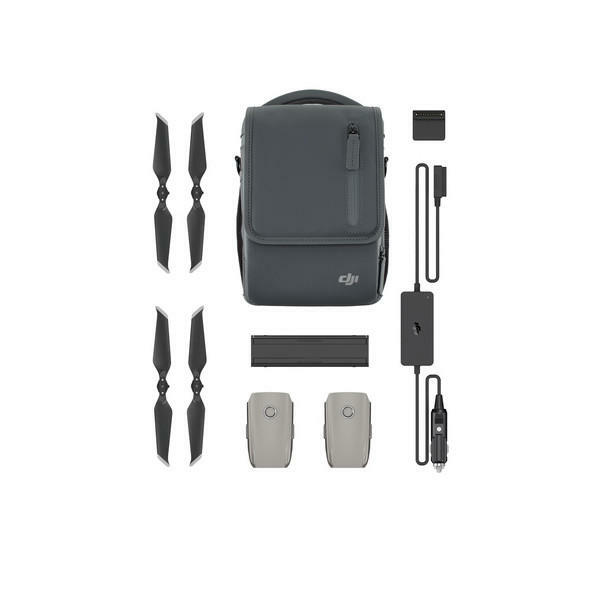 - The Mavic 2 Fly More Kit includes two Intelligent Flight Batteries, a Mavic 2 Car Charger, a Battery Charging Hub, a Battery to Power Bank Adapter, Low-Noise Propellers, and a Mavic 2 Shoulder Bag, providing you with comprehensive support during shooting. - Both Intelligent Flight Batteries have a capacity of up to 59.29 Wh, and each have a maximum flight time of 31 minutes. With a built-in DJI Intelligent Battery Management System, battery status is monitored and reported in real-time, allowing you to focus less on your power levels and more on having an epic flight. - The Mavic 2 Car Charger allows you to charge batteries while driving, and it has a maximum output power of up to 80W and features low-voltage protection technology that ensures the charge will not prevent your car from starting normally. - The Battery Charging Hub enhances efficiency by charging batteries in sequence according to their remaining power level, with more fully-charged batteries receiving power first. Thanks to the Battery Charging Hub’s foldable design, it’s easy to take it along wherever you go. You can even enjoy up to four charging ports when you use it with the Car Charger or Battery Charger. - The Battery to Power Bank Adapter turns your Intelligent Flight Batteries into high-capacity power banks. Each Battery to Power Bank Adapter has two USB Type-A ports, offering 10 W dual output, allowing you to fully charge a smartphone using just 20% of one battery. - Two pairs of Low-Noise Propellers come in the kit as well. These next-generation propellers adopt a brand new aerodynamic design, which results in quieter flight, increased efficiency, and extended flight time. 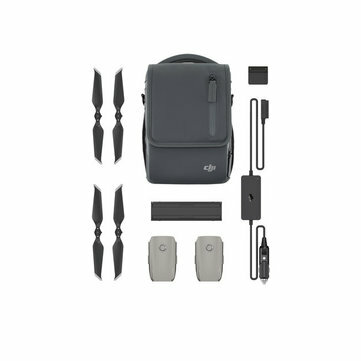 - The versatile Mavic 2 Shoulder Bag is specially designed for the Mavic 2. It’s capable of holding one aircraft, one remote controller, four Intelligent Flight Batteries, a smartphone, extra propellers, ND filters, cables, microSD cards, and plenty of other accessories. This warehouse cannot ship to your location. (1) The shipping time mentioned above refers to the estimated time of business days that the shipment will take after an order has been shipped. (2) Business days do not include Saturday/Sunday and any public holidays. (3) These estimates are based on normal circumstances and are not a guarantee of delivery times. (4) We are not responsible for the failures or delays in delivery resulting from any force majeure event, such as natural disaster, bad weather, war, customs issues, and any other event beyond our direct control. We support the following payment methods.Click for more information if you are confused about how to pay. *We currently offer COD payments for Saudi Arabia, United Arab Emirates，Kuwait，Oman，Bahrain，Thailand，Singapore，Malaysia，Philippines，Indonesia. We will send a confirmation code to your mobile phone to verify that your contact details are correct. Please ensure you follow all the instructions contained in the message. *Paying with Installment (credit card) or Boleto Bancário is only available for orders with shipping addresses in Brazil. Order 3 or more and enjoy the savings. Bulk prices will be shown in the shopping cart. How to quickly get a new good answer? 1.For questions about shipping, orders, discounts, etc. Please contact customer service, your problem will be solved faster than ask a new question. 2. Ask the question in English. 3.Keep your question short and to the point. We believe in providing not only hot gadgets and great gifts but also the best support and service. We've been delivering best bang for your buck for over 10 years, every item we stock is carefully selected to ensure we offer you top quality at competitive prices. Please make sure you agree to our Terms and Conditions.